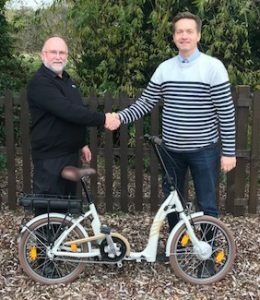 Batribike is delighted to announce a new closer partnership with Danish e-bike company Pro-Movec. A new company, Batribike Ltd, has been formed to enjoy the best possible advantages from the Pro-Movec R & D department, to offer a larger portfolio of products, to take advantage of more favourable purchasing power and to potentially gain a foothold in other markets. This fits both companies’ strategy to grow our businesses and optimally meet the demands of a changing market place. Batribike continues to produce the existing European built range of electric bikes. The new company, Batribike Ltd, is co-owned by the Coulson family and by Jesper Lundqvist CEO of Pro-Movec. The new closer partnership will give Batribike even better links to manufacturing and more leverage when vying for production capacity, as well as increased access to the latest smart developments in e-bikes. The new partnership follows on from September 2016 when Batribike announced the move to European built bikes. These e-bikes use the high quality Pro-Movec electrics system with motor, battery, controller and display all paired to give the best performance. The quality and style of the latest Batribike range has proved popular and the new relationship will continue to build the established brand. Batribike and Pro-Movec each have over ten years experience in electric bikes and both companies are committed to producing a high quality product at the best price. The Pro-Movec electric system has industry leading warranties on the motors and groundbreaking transferrable warranties – up to 5 years on batteries. This gives value in second hand electric bikes, an area where there has previously been no consumer confidence. The Batribike brand and unique styling has already proved itself in the UK market and is popular with dealers. Batribike dealers will benefit from good stock levels in our UK warehouse, competitive pricing levels, full technical support and spares back-up, customer confidence in quality European built electric bikes as well as access to latest innovations and designs. Together these two brands will continue to produce quality electric bikes with unique styling and the latest in e-bike technology.